This franchise agreement is for the franchise of services only for example, a beauty salon or a mortgage broker. The agreement is suitable where one party, the franchisor, wishes to effectively licence out his business to another, the franchisee. In return for being permitted to use the trade marks and other intellectual property of the franchisor, the franchisee will pay a fee. This is a comprehensive franchise agreement for the sale of services, for example, an accountancy firm, an architect’s practise or hairdressers. It is suitable where one party, the franchisor, wishes to effectively licence out his business to another, the franchisee. In return for being permitted to use the trade marks and other intellectual property of the franchisor, the franchisee will pay a fee. 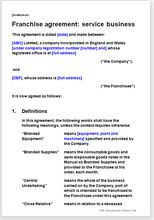 This franchise agreement has been drawn so as to be exclusive or non-exclusive – you choose. In India, there are no rules or regulations for the terms of a franchise agreement. This means that you are free to negotiate the best deal. This is a complete franchise agreement – you simply delete what is not required in order for you to negotiate what you want. The agreement deals with confidentiality and intellectual property in detail, thus protecting the interests of the franchisor. Further, this agreement specifically sets out the responsibilities of both parties, allowing a smooth and flexible relationship and one where fewer disputes are likely to occur. Protection of his investment is likely to be very important to a franchisee. The agreement covers this in detail, from franchise renewal rights, transfer with pre-emption to intellectual property that the franchisee might create. These should provide fair terms that incentivise the franchisee and allow him to benefit from having built up his franchise without the franchisor relinquishing too many rights. Other legal paragraphs to protect your interests.